Great Yarmouth Minster01493 858410work ChurchGreat Yarmouth Minster (Church of St. Nicholas) in Great Yarmouth was founded in 1101 by Herbert de Losinga (Bishop of Norwich), as a penance for an act of simony. It is the largest parish church in the country and arguably the oldest building in Great Yarmouth. During the Medieval period the church was at its most magnificent with stained glass, tapestries, painted and gilded walls, fresco, 19 guild chapels, various relics of the saints and ornate furnishings. At this time Great Yarmouth was the fourth richest town in England. The interior was destroyed at the Reformation and the Priory dissolved. This church has a fascinating history and has been beautifully restored and maintained. 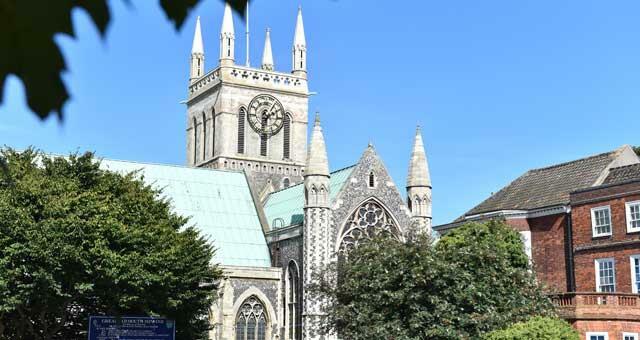 Alongside regular church services, Great Yarmouth Minster also holds a number of events which are open to the public. 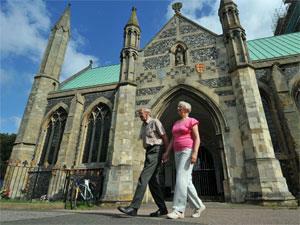 Great Yarmouth Minster is normally open daily from 10am to 3pm in winter & 10am to 4pm in summer. Opening times are dependant on volunteers being available to open the church. Refreshments are usually available during opening times. Please visit the website for details of Sunday services and other events.